In 2003, software engineer David Miller left his job, family, and friends to hike 2172 miles of the Appalachian Trail. His journey resulted in his memoir, AWOL on the Appalachian Trail, and a The A.T. Guide which has become the most popular guidebook on the Appalachian Trail. You pass a gravel road or a trail crossing and want to know where you are. Maybe it’s an indication that you’ve gone past a tent site or spring that you were looking for. The A.T. Guide has more landmarks like this than any other source. With it, you’ll be much more likely to find out where you are. You’d like go into town, for example Falls Village, to get a maildrop. Falls Village is close, but the path is not straightforward. The A.T. Guide has a map of the town, so it’s a simple matter. You want to know what kind of terrain is ahead. 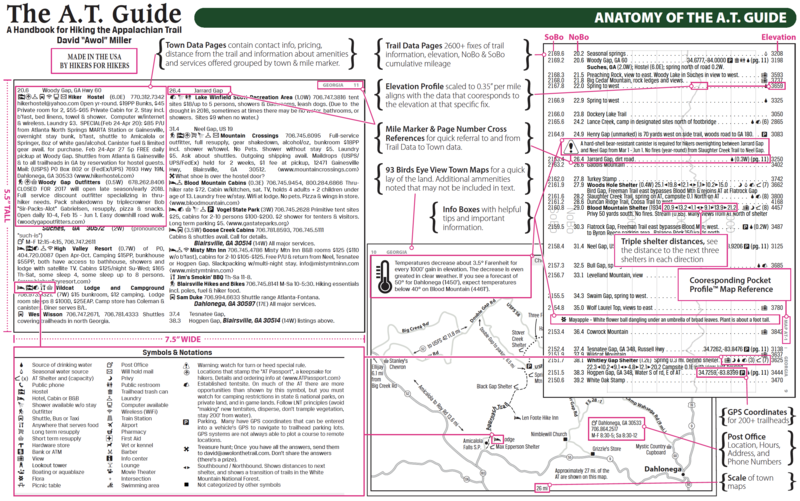 The A.T. Guide has an elevation profile. At a glance, you can see the ups and downs. Another benefit of having the landmarks aligned with the profile is that the text is spaced proportional to the mileage. Each data page in the book covers the same number of miles (20.2), so even without reading mileage numbers you can make a good guess at the mileage between landmarks. You are in town and want to know what services there are. Scan the text of each book and see how quickly you can find something, an outfitter for example. In The A.T. Guide, services such as this will all be on a line of their own, preceded by an outfitter icon. The business name is in bold. You want to hike with just the pages you need. The A.T. Guide is sold bound or loose-leaf, and every book sold from the website comes with a heavy-duty zip-lock bag. You start your day at a shelter and want to hike 15-20 miles. Will you finish near another shelter? The average shelter-to-shelter distance is less than 10 miles. The A.T. Guide gives shelter-to-shelter mileages for the next three shelters. While on the trail and looking at the mileage data, you see a road crossing with a town nearby. You want to find out if the town has something you need, so you flip to the “Town info” part of the book. In The A.T. Guide, most town services are a page turn away. Even so, every data entry with additional “town” info provides a page number to make is easier to find that info. The “town” entries have corresponding mileage, so you can easily cross-reference back to the data page.